‏The festival of Chanuka is a time of illumination and inspiration. When we reflect upon the Mesirus Nefesh of the Chasmonaim, it reminds us of our responsibility to keep the fire of Torah burning brightly despite all of the challenges presented by the world around us. The Gemara (Shabbos 21b) teaches us that “Kavsah Ein Zakuk Lah” – if the Chanuka lights are extinguished, they need not be rekindled. Nonetheless, the Halakha is that if the candles were lit in a windy place where they could not possibly have retained their illumination for the requisite time period of the obligation, then one has not fulfilled their obligation (see Mishna Berura 673:25). The Ramban notes in his commentary to the Torah (Bamidbar 8:2), based on the Megillas Setarim of Rabeinu Nissim and other Midrashic sources, that the candles of Chanuka constitute a continuation of the illumination of the Menorah in the Beis Hamikdash. “El Mul Pnei HaMenorah Yairu”– the lights shall shine brightly into perpetuity, when directed towards our eternal Menorah. The eternal Menorah is represented by the everlasting light of Torah – Ki Ner Mitzvah VeTorah Ohr. Indeed, we are taught by our Rabbis that “Harotzeh LeHachkim Yadrim” (Bava Basra 25a). One who wishes to acquire wisdom is enjoined to focus in a southerly direction just as the holy Menorah was located on the southern side of the Beis HaMikdash. Rabbi Aharon Dovid Burack zt”l, the legendary Rosh Yeshiva at Yeshivat Rabbeinu Yitzchok Elchanan from 1919-1961, noted in his address to the b’nei yeshiva in 1949 (published in Pirchei Aharon) that the lights of Chanuka symbolize the ability of Klal Yisrael to sow the seeds of Torah during times of darkness and desolation, and that the Kol Torah in our Yeshiva’s Beis Midrash epitomized the triumph of Torah in the wake of the unspeakable tragedy of the Holocaust. However, pointed out Rabbi Burack, the lights of the Torah can only illumine properly if they are left in their pristine state – Ein Lanu Reshus Lehishtamesh Bahem– the continuity of the lights from the days of the Beis HaMikdash into contemporary times, can only be assured if we do not tamper with our holy heritage. Accordingly, even if the winds of assimilation and change appear so powerful as to be capable (Chas Veshalom) of extinguishing our eternal light, we are assured Kavsah Ein Zakuk Lah – that we need not be afraid as long as we take appropriate measures to preserve the pristine light of the Torah. However, if we willingly expose ourselves to a Ruach Metzuyah of foreign influences and notions, then we have not fulfilled our obligation. Haneiros Halalu Kodesh Heim – we are obligated to maintain the holiness of our Torah environment. In order to maintain this holiness, we need to demonstrate an abiding attention – HaRagil B’Neir Havah Leih Banin Talmidei Chachamim (Shabbos 23b) – the fruits of Torah are sown through Shemiras HaSedarim, through a Kevias Itim LaTorah throughout the entire year, whether or not part of any official semester or structured Zman Limmud. In the weeks ahead, during the “bein hasemesterim” period, the b’nei hayeshiva will be privileged to maintain a regular regimen of shiurim and sedarim at the Yeshiva, and those students who are not at the Yeshiva will have the opportunity to learn Torah in a variety of other venues. 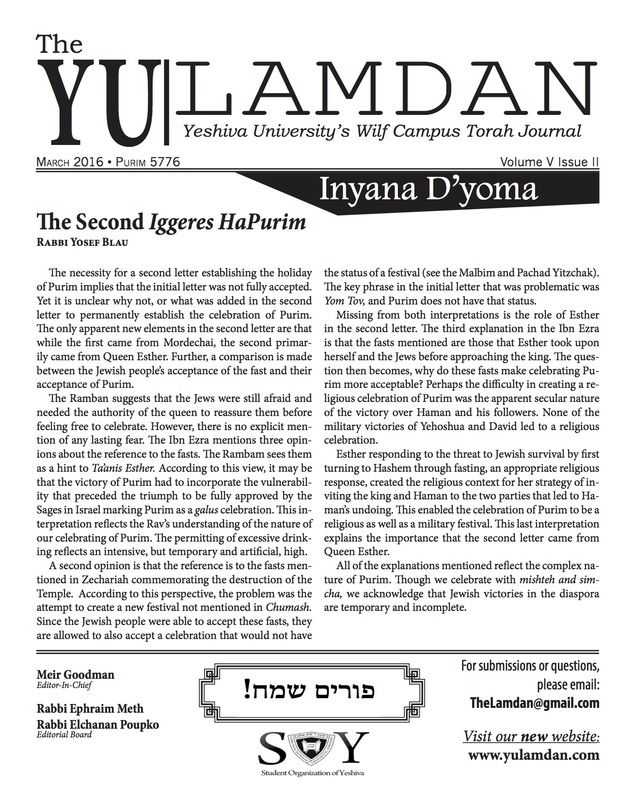 One of the goals of the Yevanim was to abolish our own internal time schedule – the mitzvah of Chodesh. We ensure the protection of our Torah lights from the seasonal winds by transcending the calendar limitations of the academic year and re-focusing on our Regilus – our unabated devotion to the eternal illumination of Torah at our Yeshiva. The B’nei Yissoschor comments on the verse VeChimeish Es Eretz Mitzrayim (Bereishis 41:34) that Yosef HaTzaddik, whose story is always read in conjunction with the celebration of Chanukah, preserved the heritage of the Torah during his sojourn in Egypt through the observance of “Chamesh” – of Chodesh, Milah and Shabbos, the three mitzvos that the Yevanim sought to eradicate during the days of the Chashmonaim. In this vein, he explains the Midrash (Midrash Rabbah 2:4) in connection with the verse “VeChosech Al Pnei Sehom” (Bereishis 1:2) – that states that the word “Choshech” stands for the kingdom of Yavan, which told the Jewish people Kisvu Al Keren Par She’Ein Lachem Chelek Beilokei Yisrael – “write on the horn of the ox that you have no portion in the G-d of Israel.” The ox is representative of Yosef, who is described as “Bchor Shoro Hadar Lo” as being compared in beauty to an ox. We can thus understand the taunt of the Greeks as expressing their sentiment that Yosef’s ability to maintain his distinct identity in exile was no longer tenable during a time of evolving values and morals in the surrounding universe. To this challenge we must respond with the brightness of the Chanukah candles, and their message of celebrating our uniqueness through the sanctity of Shabbos, through our mastery over our bodies and our calendar, and our refusal to subjugate ourselves to the distractions, diversions and moral decadence of the world around us. The Meiri (Shabbos 21b) cites the custom of the Gedolei HaTzarfatim to wait until the conclusion of one’s learning seder before lighting the Chanukah candles – “VeChein Nohagim Sham B’Nei Yeshiva Lehadlik Achar She’Omdim MiBeis Hamedresh”. This practice is puzzling, given the usual imperative of Zrizin Makdimi Lemitzvos– of performing mitzvos with alacrity and immediacy. Perhaps we can explain, based on the foregoing discussion that the message of the Chanukah candles is to remind us of the inextinguishable and unperishable nature of Torah study and Torah living in our lives regardless of circumstances or surroundings. It is thus through the uncompromising preservation of our Torah learning, as expressed through the inviolate nature of our Torah learning time, that we are best able to prepare ourselves for the optimal performance of the mitzvah of lighting the Chanukah candles. Yona Reiss is an American rabbi, noted Torah scholar, attorney, lecturer, and jurist, and the current Av Beth Din of the Chicago Rabbinical Council.